Devendra Kapoor was born on 5th February, 1912 in Amritsar (INDIA). He graduated in 1931 with honours in Sanskrit, through the D.A.V. College Lahore, now in Pakistan. He further studied Sanskrit under the guidance of Pandit Brahmdatta Jijnyasu. Devandra’s father, Shri Rooplal Kapoor had established a cheritable trust called Ram Lall Kapoor Trust in 1928 in the memory of his father for the research, publication and propagation of the Vedic. Literature. This trust has rendered a yeoman’s service in this direction. 1. Success Motivating Vedic Lores. 2. Vedic Concept of Yoga Meditation. 3. Lectures on Yoga Meditation as revealed in Holy Vedas. 4. 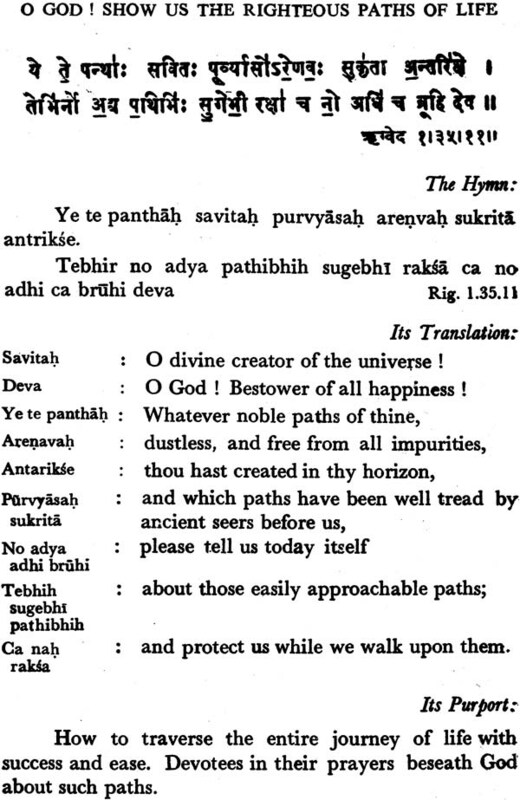 Vedic Piyush Dhara (in Hindi). Vedas are the oldest revealed scriptures in the world. They are the oldest book in the library of the world. All scholars agree on this point. These are the fountain head and inexhaustible mine of all true knowledge of science and spirit. They are the loftiest and most admirable. 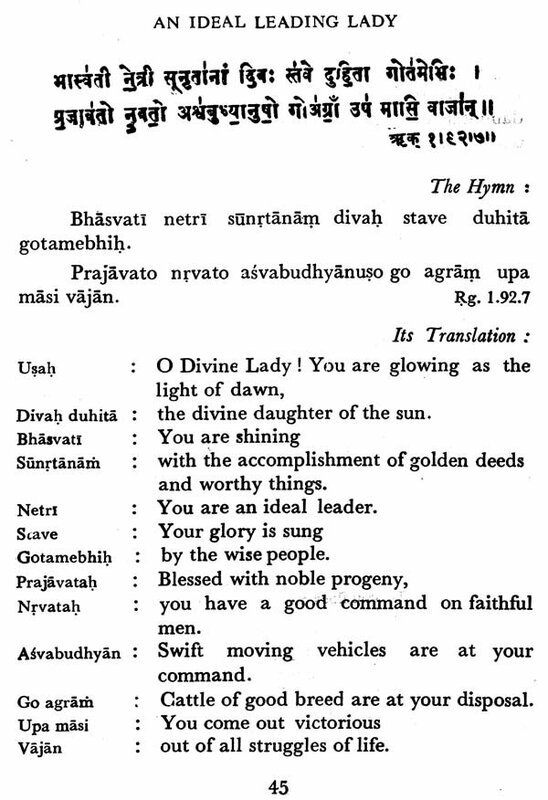 Our present publication of ‘Success Motivating Vedic Lores’ is an humble attempt to interpret fifty-one Vedic hymns of Rig Veda, for English knowing public, according to the light shown by this great seer, Svami Dayanand Sarasvati. This is a quest for true wisdom and righteous paths. God is described in various hymns as One, unique Deity. He is Supreme Lord, the Creator of this Universe. He is omnipresent, omnipotent and omnicient. Although one, He is described in various forms according to His innumberable attributes. He is described as Agni, Indra, Mitra, Varuna, Visnu, etc. These words have to be correctly interpreted in their derivative significance, and according to the subject matter (Devata) and with reference to the context of particular hymn. 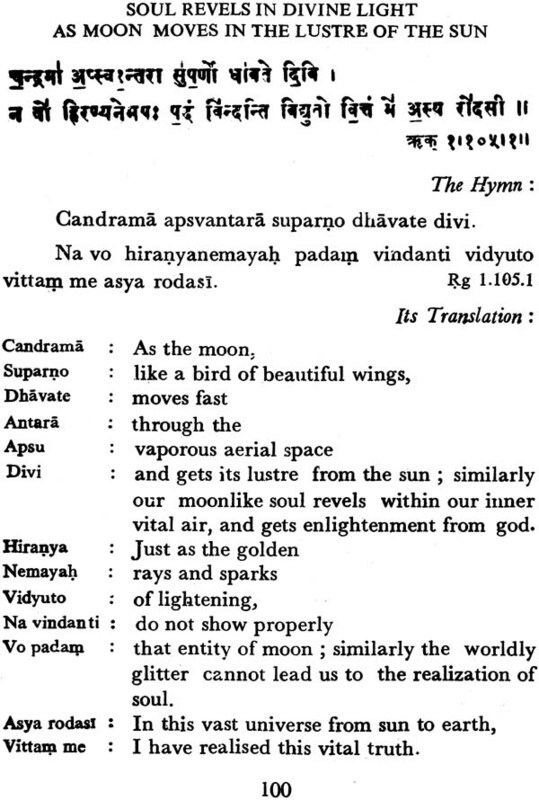 This is the real key to the correct interpretation of Vedic hymns. This method is clearly explained in the Brahmana literature, the earliest commentaries and subsequently explained by the sage Yaska, the author of Nirukta. In such various forms God is invoked to bestow peace and bliss on the human beings. Human soul is inspired in many hymns to achieve the highest pinnacle of glory. Simple ways are described to achieve that. Human souls are motivated to acquire true wisdom and fire their enthusiasm to set in motion all their inner potentiaities to translate their desires for success into deter- mined actions. Such actions have to be continued till the final goal is achieved. 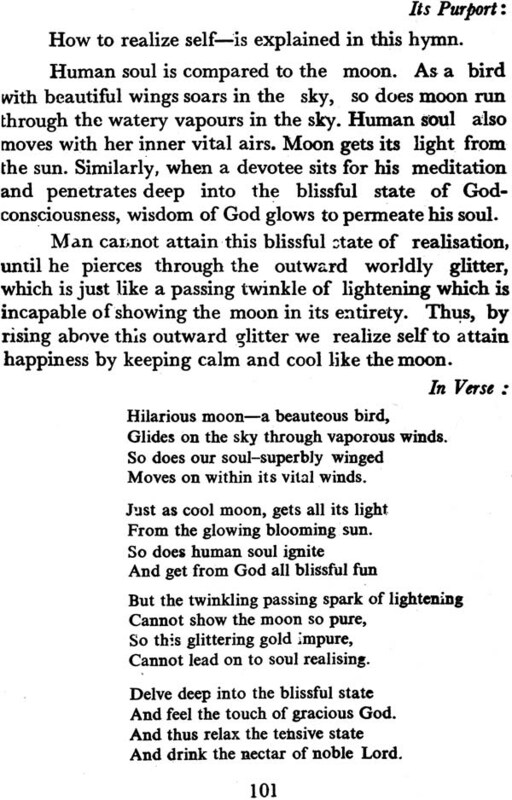 For acquiring true wisdom, human soul is pictured as moon and God as the Sun in one of the hymns. Just as moon gets all its lustre from the Sun, similarly soul gets all its, light of wisdom from God. Human beings are motivated to awaken early in the morning and realize this Luminous Light of God in their deep Yogic meditation. Human beings are motivated to acquire all the noble virtues of God by meditating on various attributes like Agni, Indra, Mitra and then mould their minds with such attitudes. Just as a block of iron when put in the heated furnace, becomes red hot like fire, similarly human soul, while entering into God- consciousness becomes God-like. Equipped with Divine virtues, there remains nothing that cannot be achieved by the human soul. This is the highest stage of the supreme bliss and ecstacy. All tensions are relieved. All knots are unfolded. Complete relaxation is experienced. Thus, masters of all the worldly powers, man and woman enjoy their most coveted married life. There is a beautiful description of the Vedic lady. In many hymns she is compared to the dawn. Luminous, aglow with holy lustre, she is elixir of married life. In one of the hymns she is described as a young damsel approaching her lovelorn husband, with all the beauteous charms and graces of a young girl, with a soft body, with strong elevated bosoms, ever smiling, she captivates her husband with her deftness and amorous glances. And a husband is compared to the sun in his vigour and to a cloud in showering all the pleasures upon his wife. Thus a married life is turned into a veritable paradise. All the noble virtues and divine personages make such a household their permanent abode. The chariot of such a happy married life is described as moving on and on towards the temple of perfect peace and happiness. In another hymn parents are ordained to guide their children to the noble paths. As the sun imparts its lustre to his daughter dawn, similarly parents are advised to touch the heads and hearts of their children to make them luminous with the light of true wisdom. In three hymns a truthful man is depicted as enjoying sweetness of honey in every walk of his life. Each particle becomes honey drenched for him. In ideal self rule, every subject is expected to have an equal opportunity to work and acquire all means to lead a happy successful life. Technicians and scientists are conceived to assemble an aeroplane with fastest speed like the speed of mind. But only for protective purposes and not destructive. A graceful old age is described where a man keeps fit and fine till hundred years. He voluntarily relinquishes the keys and gives all responsibility to his sons, who become his saviour in his old age. The entire journey of human life is depicted as a blissful blending of worldly prosperity and spiritual peace. 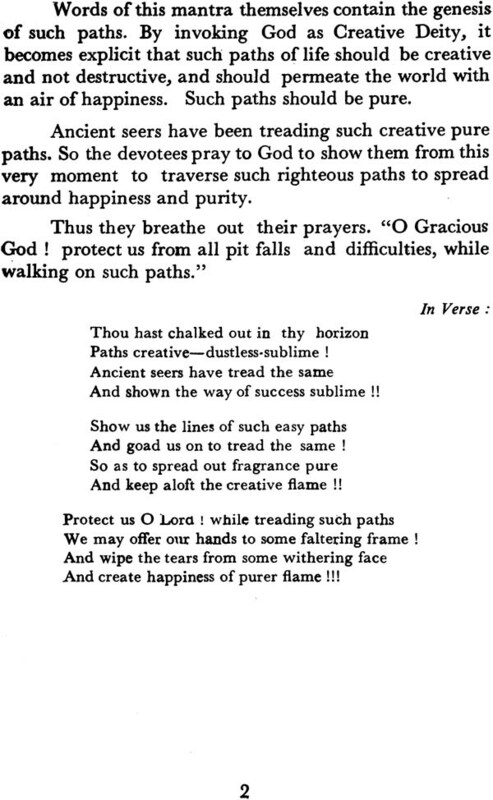 A great need was felt for an English translation of Vedic hymns, showing Vedic way of life. In this book we have selected fifty one hymns from the first Mandala of the Rgveda. Our humble attempt would be amply rewarded if, even a few English knowing souls get electrified by these few inspiring Vedic thoughts and be motivated to achieve real lasting peace, success and happiness in their lives. An embodiment of justice, knowledge and humility, Justice H.R. Khanna readily agreed to our request to write an introduction to this book. We are grateful to him.’ His inspiring writing will surely elevate our readers to a higher plane of’ peace, bliss and success. We are highly obliged to Shri Satya Shrava for taking the entire responsibility of getting this book printed in Delhi. He is the worthy son of his illustrious father, the late Shri Pandit Bhagavad Datta, the well known research scholar of international fame and author. of various books on Vedic literature. But for Shri Satya Shrava’s sincere efforts and other good suggestions, this book could not have come out in such a nice fomat. May the propagation of Vedic thought bring peace to the tormented world, and rear a new earth in the image of Blissful Heavens. “Did God create man or did man create God?” is the question which is posed by Dostoevski through one of his characters in ‘Brothers Karamazov.’ Perhaps the answer .to both the parts of the question is in the affirmative, depending upon the way one looks at the problem. For the devout and the faithful, the Universe and all animate beings owe their existence to God. For the man going through the stress and strain of modern times some kind of haven is needed, some secure anchorage in the tempests and storms of life. Such haven and anchorage are provided by a power, call it by whatever name you like, Deity, God or Supreme Being. Without the support of such power, man would be like a rudderless vessel afloat on the surface of sea, at the mercy of waves and strong winds. Life would then lose all purpose and the motivating inner urge which enkindles faith and goads us to higher values and nobler way of living would wither and face extinction. It was this feeling that prompted Voltaire to say that if there be no God, it would have been necessary to invent Him. We need synthesis of intellect and faith. Growth of human intelligence and expansion of rational faculties cannot provide answer to many aspects of life and the great mysteries of the Universe. As observed by Joad, the greater is the advance of scientific knowledge, the more one becomes conscious of the Supreme Being. March of science instead of taking man away from religion has made him more religious and enkindled fresh faith in godhead. Sky is your limit. Ye tear asunder all your obstacles as the rays of the sun tear off the clouds. Question : What is this Universe? From what does it arise? Into what does it go? Answer : In freedom it rises, in freedom it rests and into freedom it melts away. I hope that this book would enkindle interest and create further awareness of the Vedic lore amongst those who cannot have access to the original texts of Vedas in Sanskrit.